A few posts back I had a photo of Stoneleigh Mansion in Bassett, Virginia…originally built in 1929 and now vacant …as it has been for years. Ghostly place to say the least. In that regard, this is what a visitor is greeted with at the front door. 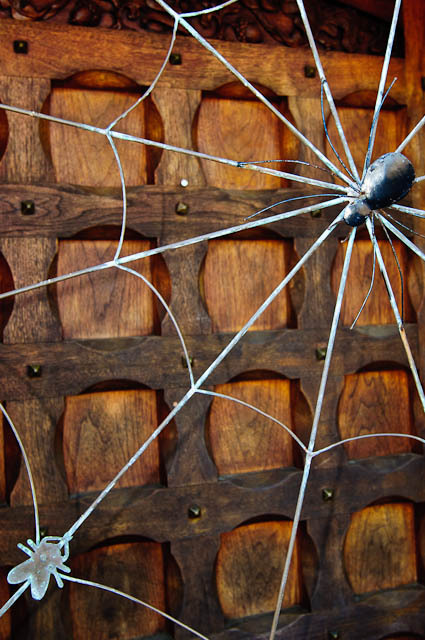 This decorative wire artwork is acting like a screen door…without the screen. The massive wooden door itself is pretty impressive, but when you add the “spider and the fly” it’s a unique welcome.